Three Nebraska wrestlers earned the coveted All-America status during the highly competitive Day Two of the 2018 NCAA Wrestling Championships at the Quicken Loans Arena in Cleveland, Ohio, on Friday. Junior Tyler Berger earned his second All-America honor at 157 pounds, while redshirt freshmen Chad Red Jr. and Taylor Venz earned their first. This is the fourth straight season Nebraska has had at least three All-Americans, and the 30th consecutive season with at least one. The Huskers are in 14th place with 34 points after starting the day in 20th place with just eight points. The battle for a top-10 finish is tight with just 5.5 points separating teams No. 10-16. The Huskers journey on Day Two went as follows. Red, unseeded at 141 pounds, won both of his matches in the morning session, defeating Ryan Diehl of Maryland and Vincent Turk of Iowa. However, neither of those victories, nor any he earned this season, amounted to what he accomplished in the Round of 12 Friday night. The odds were stacked against Red with his opponent Dean Heil of Oklahoma State having two NCAA titles to his name, but that didn’t faze Red. With just over a minute left in the opening period, Red forced Heil into a deep headlock and quickly flipped the defending champion onto his back. Heil tried to fight his way out, but Red was too strong. Red earned the first-period fall to clinch his spot on the podium. With his win against Heil, who is from the Cleveland area, Red became Nebraska’s first All-American at 141 pounds since Matt Murray in 2004. After rattling off a four straights wins following an opening round loss on Thursday morning, Red’s hot-streak came to an end in the consolation quarterfinals. Fifth-seed Kevin Jack of North Carolina State defeated Red in tiebreaker-1, 2-1. He will wrestle for seventh place Saturday morning. Chad Red Jr. celebrates after his win over two-time champion Dean Heil of Oklahoma State. Berger, seeded No. 8 at 157 pounds, started Day Two in the championship bracket, but was forced to fight his way through wrestlebacks after a quarterfinal loss to the top seed Hayden Hidlay of North Carolina State. In the Round of 12, also known as the Blood Round, Berger avenged his dual-season-finale loss to Paul Fox of Stanford, winning by decision 6-3. Berger continued his night session comeback with a shutout decision, 6-0, against No. 13 seed Luke Zilverberg of South Dakota State. Venz, Nebraska’s third and final All-American, has wrestled in 22 tournament matches this season. He’s won 18 of those matches, including 13 by way of bonus points. Venz was on a tear from the opening whistle of his first match on Friday morning, winning the first by technical fall 19-1 with 6:01 of riding time, and the second by major decision 16-4. In the Round of 12, Venz knocked off No. 4 seed Pete Renda of North Carolina State by major decision 11-3, this time racking up 6:41 of riding time. To put that into perspective, a full match is seven minutes long. This is the fourth-straight year Nebraska will have an All-American at 184 pounds after T.J. Dudley accomplished the mark the past three seasons. In his final match of the day, Venz secured a spot in the consolation semifinals with an 11-6 decision victory against No. 9 Max Dean of Cornell. 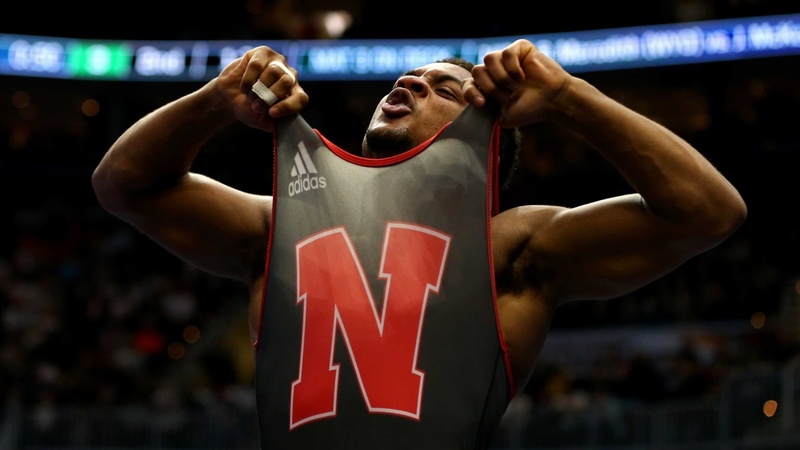 The Huskers only loss in the Round of 12 came at 165 pounds. Nebraska’s second quarterfinalist Isaiah White, seeded No. 11, matched up against the No. 3 seed Vincenzo Joseph of Penn State in a battle of NCAA Champions, during the morning session. White is the reigning Division II champion at 165 pounds, while Joseph is the reigning Division I champion. After upsetting No. 6 seed Richie Lewis of Rutgers in the Round of 16, White nearly pulled off another upset. Joseph and White needed overtime to decide a winner, going all the way to the second sudden-victory period. Joseph scored a takedown to win the intense match 4-2. Needing a win in the Round of 12 to stay in contention, White lost in overtime again, this time in tiebreaker-1 to Jonathon Chavez of Cornell, 2-1. White finished with a 25-8 record this season. After advancing to the second day of competition, senior Colton McCrystal and redshirt freshman Eric Schultz’ tournament runs ended Friday morning in the third round of consolations. McCrystal, seeded No. 13 at 149 pounds, won his first match by decision, 5-2, against No. 14 seed Beau Donahue of North Carolina State, but lost to No. 6 seed Justin Oliver of Central Michigan 5-2. This was the second time McCrystal was defeated by Oliver this season. Oliver won by major decision, 12-0, at the Cliff Keen Invitational on Dec. 2. McCrystal finished his Nebraska career with an 83-36 record, including a 23-7 this season. This was his second NCAA tournament appearance. Schultz also won his first match of Day Two, knocking off No. 13 seed Jeric Kasunic of American by decision 3-2. In the third round of consolations, Schultz came out on the losing end of a close match, falling to Jacob Holschlag of Northern Iowa in a 3-2 decision. Schultz finished the season with a 20-11 record after earning an at-large bid to the NCAA Championships. Session V will begin at 10 a.m. CT on Saturday with the consolation semifinals and placement matches. The session will be aired on ESPNU. Session VI will begin at 7 p.m. CT Saturday night with the championship matches. The session will be aired on ESPN.